Around the country, there are calls to reform our election process. Activists want to ensure that the outcomes of elections properly reflect the will of the people. Because elections are administered at the local level, this results in experiments in radical democracy in likely and unlikely places. Ranked choice voting is one of those experiments that is gaining traction. Under this system, there are no runoff elections. 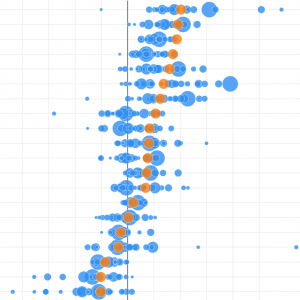 Instead, the voter ranks candidates in order of preference, and there is an instant runoff. It’s used statewide in Maine, and at the municipal level in San Francisco, Oakland, Minneapolis, and St. Paul, among others. New Hampshire isn’t far behind, either. 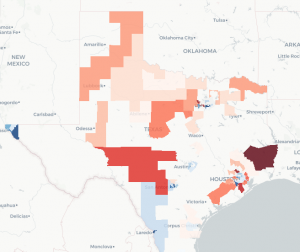 Even though ranked choice voting is technically illegal in Texas, I wanted to learn more about how it would work in Harris County, since we have so many runoff elections. After all, laws can change. What would happen if we could eliminate the need for runoffs? How much money would we save? How could it change the dynamics of the electorate? Sure, these are fun, exploratory questions. But there is also urgency. If there is even a possibility of implementing ranked choice voting in the next decade, we have to get smart quickly. Harris County is going to purchase new voting machines soon. Is ranked choice voting a good idea for our community? We can figure that out later. Right now, we need to make sure that future voting machine requirements can accommodate ranked choice voting. That makes the idea possible. Otherwise, we will have to wait ten to fifteen years for the next opportunity. Under ranked choice voting, a voter “ranks” candidates in order of preference. When the ballots are counted, the candidate with the lowest number of top votes is eliminated, and the vote is awarded to the second choice on each ballot. Then the votes are counted again, and the process repeats until there is a majority winner. 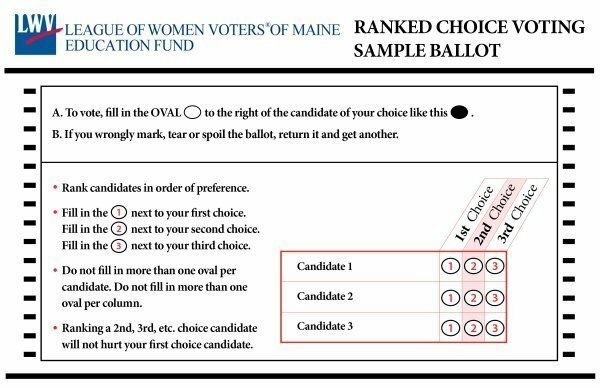 Sample ranked choice voting ballot. Voters rank candidates in order of preference. Image courtesy of the League of Women Voters of Maine. Proponents of ranked choice voting insist there are significant benefits over traditional winner-take-all voting. The most relevant benefit to our analysis is that ranked choice voting eliminates the need for separate runoff elections. Instead, the ranking process creates an “instant runoff” with a winner declared from the initial ballots cast. Also, ranked choice voting may increase the viability of long shot candidates. The thinking goes, when you rank candidates instead of voting in a winner-take-all contest, you are not “throwing away” your vote on a candidate that is unlikely to win, since you can cast a “safe” vote with your second or third choices. According to a small survey of seven cities, ranked choice voting also gives voters the perception that the campaign was less negative than previous, winner-take-all contests. These objections are worth investigating simply because there is not enough evidence yet to prove or disprove their conclusions. If we eliminate the runoff for municipal elections, it raises the stakes for the general election. 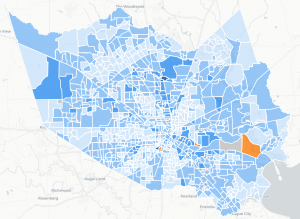 In Houston, there are more voters in general elections than runoff elections. Ranked choice voting would make their vote count in the entire election, not just the qualifying round. In the 2015 Houston municipal election for Mayor, there were 52,223 more voters in the general than in the runoff. Ultimately, Sylvester Turner won and defeated Bill King by 586 votes in the runoff. What would have happened if everyone who voted in the general showed up to vote in the runoff? Would that have changed the outcome or increased the margin of victory? Here’s another way to think about the outcomes of a crowded field: There were thirteen candidates for Mayor in 2015, and nine of those candidates received over 1,000 votes. There were 113,356 votes in the general election for candidates other than Turner and King. That represents 43% of all votes cast. If these voters had a second choice, who would they pick? Eliminating municipal runoff elections would save the City of Houston a lot of money. We can get a sense of the cost savings by looking at previous runoff election costs. In 2015, the actual cost of the runoff election to the City of Houston was $1,751,721. Costs shared between the City of Houston and Houston Independent School District for the 2015 municipal runoff election. Data provided by the Harris County Clerk’s office. Assuming that the City of Houston will hold municipal elections every four years, and there is a high likelihood of a runoff election, we project the City of Houston can save more than five million dollars over the next three elections. That estimate covers the next twelve years, which is approximate lifespan of any new voting equipment. This estimate does not take into account special elections, which could present additional savings. In other areas, some people have objected to ranked choice voting by citing the added expenses of new equipment, voter education, and testing. But since Harris County is going to buy new voting machines anyway, these are not new costs, and should already be accounted for in the budget. Another major barrier to ranked choice voting in Texas are the state’s election laws. Back in 2001, then Texas Secretary of State Henry Cuellar told the City of Austin that “preferential” majorities, like those used in ranked choice voting, are at odds with the election law’s requirement of “traditional” majorities. However, election laws can be amended. The current interpretation of the law is 18 years old, and it predates the national trend of experimenting with ranked choice voting. This could be an advocacy pillar for the next legislative session in 2021. Hart Intercivic is the only of these three vendors to have a federally certified system tested for RCV ballots. Because Hart systems are not yet used to conduct RCV elections, precise information on its RCV-readiness is less clear. According to Hart representatives, its system can be modified to read and tabulate ranked ballots. The exact capabilities are unclear, but St. Paul, MN will be using a Hart system to conduct its RCV elections in 2017, and they report that the tabulation will be conducted internally, meaning that no third party software or other workaround will be used. It is not clear whether the models that Harris County owns can accomodate ranked choice voting. If they can, then it would require additional machine customization and it would make Harris County the test case. What about the rest of Texas? Fairvote has an excellent summary of ranked choice voting compatible equipment that goes beyond machines certified by the State of Texas. Even with these limitations, there are lots of counties across the state that could consider ranked choice voting. In fact, there are 55 counties in Texas that have ranked choice voting compatible equipment already. Additionally, there are another 81 counties in Texas that could be compatible with additional programming and third party validation. If you live and vote in one of these counties, contact your County Clerk and ask about their research into ranked choice voting. Research the limitations of ranked choice voting in current Texas election law and mobilize advocates to change the law. Investigate whether the current voting machines can be adapted to accommodate ranked choice voting. Study the impact, benefits, and consequences of ranked choice voting in similar jurisdictions and provide findings to the Texas Secretary of State’s office (and the public!). Incorporate ranked choice voting technical requirements into the next voting machine procurement. This is a team effort. Even though the County Clerk’s office is the agency responsible for elections in Harris County, these next steps to reduce election costs could be a joint effort between the City of Houston and Harris County. Jeff is passionate about data. He founded January Advisors and Sketch City, and serves on the board of the League of Women Voters of the Houston Area. Read his full bio on LinkedIn. Did Late Openings at Nine Polling Locations in Harris County Affect Voter Turnout? By David McClendon	| November 13, 2018	| Comments Off on Did Late Openings at Nine Polling Locations in Harris County Affect Voter Turnout?